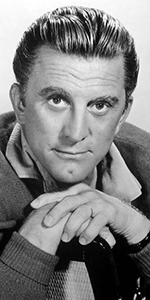 Kirk Douglas was one of Hollywood's leading stars in the post-war era. An actor with a powerful personna, Douglas specialized in playing tough idealists on both sides of the law and morality. It suited his character to the point where, even if he was playing a villian, you rooted for him somehow. Born into a large family of six sisters, Kirk's Jewish parents had immigrated from Belarus, when it was part of the Russian Empire. Settling in upstate New York, Kirk's father Herschel became a ragman; the family spoke Yiddish at home. To help with family finance, Kirk sold snacks to local mill workers, delivered newspapers and held a wide array of odd jobs. Acting in high school gave him the resolve to become an actor. Attending St. Lawrence University required Kirk to work as a gardner and janitor — a deal he brokered with the dean's office. A rather intense wrestler, Kirk made money one summer wrestling at a carnival. Kirk won a scholarship to attend the American Academy of Dramatic Arts in New York City, where he met the future Lauren Bacall. They dated and she helped him out, but nothing further. Enlisting in the U. S. Navy after Pearl Harbor, Douglas (he changed his name upon entering the service) was comminications director on a submarine chaser. Injuries from an accidental depth charge gave Douglas a ticket home in 1944. Married in 1943 to Diana Dill, Douglas had son Michael in 1944 and Joel in 1947. They would divorce in 1951. Finding work in radio and commecials, Douglas eventually took over for Richard Widmark in the play Kiss and Tell in 1945. Lauren Bacall introduced Douglas to producer Hall B. Wallis, who cast him in The Strange Love of Martha Ivers (released in September, 1946) with Barbara Stanwyck, and Douglas was off to the races. Douglas played a diffedent bad guy looking for his girlfriend hiring P.I. Robert Mitchum in Out of the Past (released in December, 1947), which has become a key noir film. Douglas became a very popular figure in films, and starred in many westerns as well as urban dramas. He brought a viceral power to The Champion (released in May, 1949), playing an intense young boxer. This film made him a full-fledged star. He was top-billed as a jazz trumpter over Doris Day in Young Man with a Horn (released in March, 1950), and did his first western Along the Great Divide (released in June, 1951). Douglas then starred in one of the most notorious flops of his career, Ace in the Hole (released in July, 1951), where he played a morally bankrupt newspaper reporter who causes a delay in the rescue of a man trapped in a cave to get more milage out of the story. The bitter film was rejected by audiences of the day, although it has come to be seen in a better light currently. Now, all the big directors wanted Douglas. William Wyler cast him as the main character in Detective Story (released in October, 1951). Vincente Minnelli saw Douglas as a perfect fit for his film about a successful, if morally dubious film producer in The Bad and the Beautiful (released in December, 1952), which is one of Douglas' signature roles. Minnelli also saw something else in Kirk Douglas: an uncanny resemblance to painter Vincent Van Gogh. The underwater fantasy 20,00 Leagues Under the Sea (released in December, 1954), placed Douglas in a more friendly mode, singing a number to a seal while playing a squeezebox. A Douglas film finally played the Chinese with The Racers (played in February, 1955) with Bella Darvi! Director Vincente Minnelli finally got the greenlight for his Van Gogh picture. Their film of Lust for Life (released in September, 1956) is one of Douglas's best; he captures the drama of Van Gogh's struggle with great imagination and pathos. It was while filming Lust for Life, that Douglas met and married Anne Buydens, with whom he would have two more sons. They are still happily married. After playing Doc Holliday in Gunfight at the O.K. Corral (released in May, 1957), he formed his own production company to make Paths of Glory (released in November, 1957) which has since become a classic anti-war film. Although the picture underperformed at the box-office, Douglas enjoyed being producer, and so The Vikings (released in June, 1958) became his next project. All this was a warm-up to his most ambitous picture. Spartacus (released in October, 1960) featured Douglas in the role he was born to play: the determined, but ultimately doomed leader of the slave revolt against the Roman Empire. With a brilliant script by blacklisted writer Dalton Trumbo, and impressive direction from Stanley Kubrick, Spartacus became everything Douglas wanted it to be: big, colorful, thought-provoking, and successful at the box-office. Producer / star Douglas and writer Dalton Trumbo re-teamed for the western Lonely Are the Brave (released in May, 1962), then played a quadruple part for director John Huston in The List of Adrian Messenger (released in May, 1963). 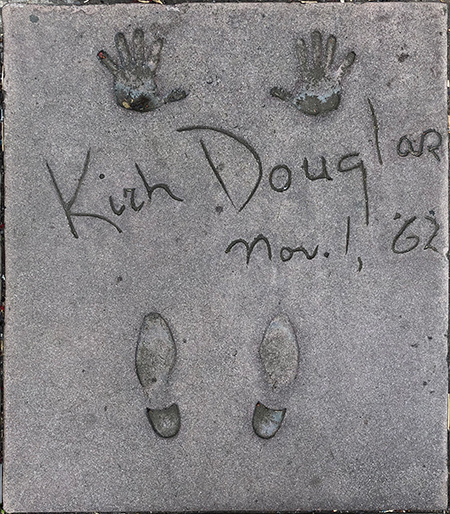 Later that year, Douglas starred as Randle P. McMurphy in One Flew Over the Cuckoo's Nest on Broadway from November, 1963 to January, 1964. Although the play was only a moderate success, Douglas hoped to make a film of it; years of trying passed before he gave the rights to his son Micahel who would produce the multiple Oscar winner in 1975. Returning to the cameras, Douglas produced and starred with Burt Lancaster in one of his favorites, Seven Days in May (which played the Chinese in March, 1964). Cast a Giant Shadow (which played the Chinese in May, 1966), saw Douglas play "Mickey" Marcus, Isreal's American-born General. Douglas played a U.S. Senator leading pioneers to Oregon in The Way West (released in May, 1967). He co-starred with Faye Dunaway in The Arrangement (released in November, 1969) bringing it alongside method acting Dunaway and director Elia Kazan. Douglas directed himself in the comic swashbuckler Scalawag (released in October, 1973). He also directed himself in the western Posse (released in June, 1975). Douglas entered the fantasy genre in director Brian De Palma's The Fury (released in March, 1978), then tried science-fiction with Saturn 3 (released in February, 1980), then time-travel in The Final Countdown (released in August, 1980). Traveling to Australia, Douglas played a double role in the western The Man from Snowy River (released in March, 1982), and co-starred one last time with Burt Lancaster in Tough Guys (released in October, 1986). Douglas took on the role of Matthew Brady opposite Jason Robards, Jr. as Henry Drummond in a television version of Inherit the Wind, aired over NBC in March, 1988, and played a grandfather with dyslexia in The Secret, aired over CBS in April, 1992. He did a one man show, Before I Forget onstage at the Kirk Douglas Theatre (the former Culver Theatre) in Culver City, which was filmed and released in November, 2009. Douglas he written several books, including his autobiography, The Ragman's Son in 1988, and a semi-autobiography, Let's Face It: 90 Years of Living, Loving and Learning in 2007. Douglas published his account of the production of Spartacus entitled I Am Spartacus! : Making a Film, Breaking the Blacklist, which occassioned the re-dedication of his footprints in the Grauman's Chinese Theatre Forecourt, follwed by a screening of Spartacus on Tuesday, June 12, 2012. Douglas has appeared with Carl Reiner in a new documentary, called If You're Not in the Obit, Eat Breakfast (released in May, 2017). Go, Kirk, Go! Grauman's Chinese Theatre, Hollywood, California. 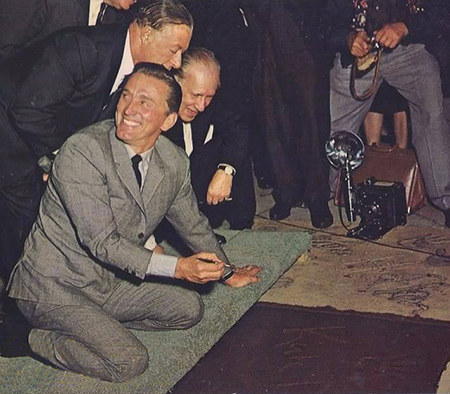 Kirk Douglas Forecourt ceremony, Thursday, July 26, 1962. Douglas puts the finishing touch to his block as National Theatres executive Eugene V. Klein and retired president Elmer C. Rhoden look on. Grauman's Chinese Theatre, Hollywood, California. Kirk Douglas Forecourt rededication ceremony, Tuesday, June 12, 2012. 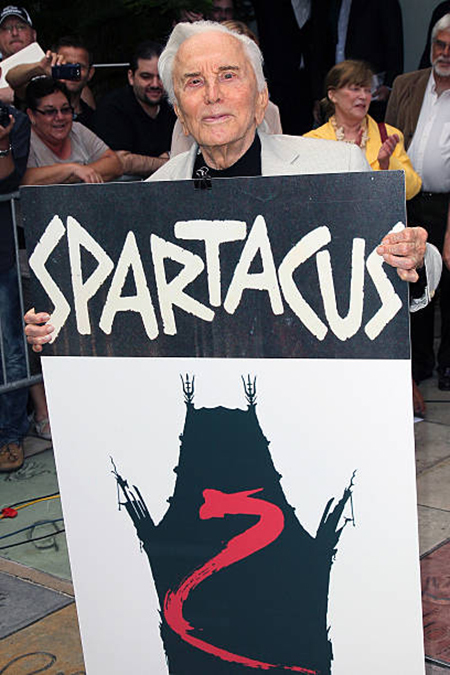 Douglas holds the logos for both the film Spartacus and the Chinese Theatres, LLC. Kirk didn't stay to watch the film.